This may be obvious to most readers, but it wasn’t to me: When you eat pancakes in most restaurants such as IHOP, the syrup that they bring you is not maple syrup: most of the time, it’s some gross colored syrup made out of corn and artificial colorants. This is the reason why I get honey instead. 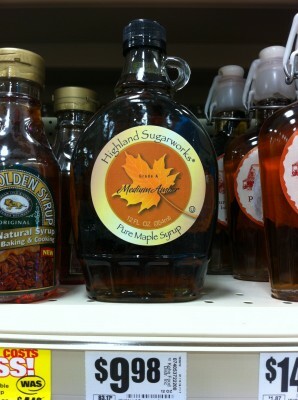 Ask for real maple syrup one day: you’ll taste the difference right away. It’s also better for you. 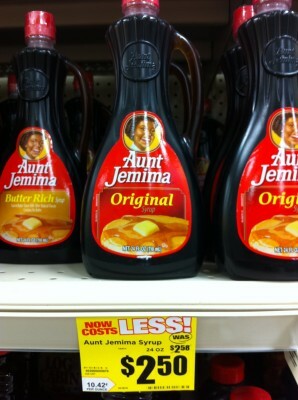 Why don’t you always just get maple syrup? The answer is in the photo below. A ver si Pepe nos trae sirope de Maple canadiense. How did I miss this post? I’m behind in my blog reader….great minds think alike!